Our favorite Super Hero characters in a great dog ID tag! Makes a perfect addition to one of our Marvel or DC Comics Buckle Down collars. 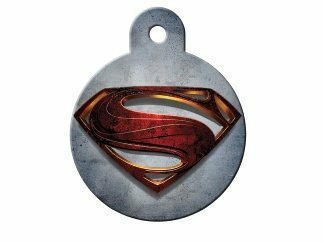 Our Quick-Tag Super Hero Licensed Personalized Engraved Pet ID Tags are top quality and a must have for every pet. Not only are our Super Hero Personalized Engraved Pet ID Tags fun they are crucial part of your pet's safety. Even if your pet is microchipped, our tags can help with a quick return by providing quick owner contact information. Officially licensed character logo is on one side and engraved personal information is located on the other side. Our Large Circle ID Tags can be engraved with up to five lines of personal information (16 characters per line) such as your pet's name, your name, phone number and address. .Engraving is free form and you can enter as much or as little information as you want. We recommend abbreviations when possible. The Amazon customization screens are not an exact proof for font size. It is a preview mainly intended to show maximum characters and identify typos. We reserve the right to make minor layout changes if necessary to optimize your tag. Engraved items are non-refundable so please contact us before ordering if you have questions. Select Shipping Rates and Policies below for additional details on shipping and engraving options. Officially licensed Super Hero tag. Are you ready for the duel?? If you have any questions about this product by Quick Tags, contact us by completing and submitting the form below. If you are looking for a specif part number, please include it with your message.